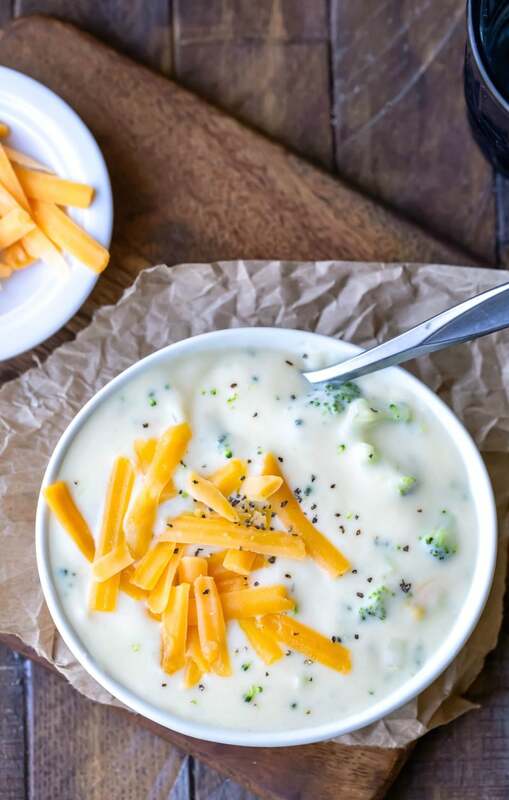 Whip up this easy homemade broccoli cheese soup recipe from scratch in just 30 minutes! And it tastes even better than restaurant broccoli cheese soup! I love making copycat recipes at home! There’s just something about being able to make my restaurant faves at home that’s so satisfying. 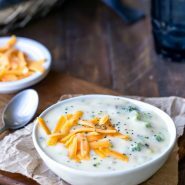 This broccoli cheese soup recipe is as good (maybe even better) than any broccoli cheese soup that I’ve had at any restaurant. It’s really easy to make, and the soup is thick and velvety. It has nice cheese flavor without tasting like just a bowl full of melted cheese (though you could certainly add more cheese if that’s your thing). You might be tempted to cut the amount of butter down, but the amount of butter is necessary for the flour mixture that you’ll make in step 4. Also, you won’t to shorten the cooking time in step 4 because that’s when the flour taste will cook out. This is a fairly thick soup as-is. However, if you’d like it extra thick, simply use more flour. If you’d like a thinner soup, you can add more milk or chicken broth to the soup. Or simply use more cream at the end to thin the soup (and make it richer!). You don’t. You can simply use more milk in place of the cream for a thinner, less rich soup. You can! 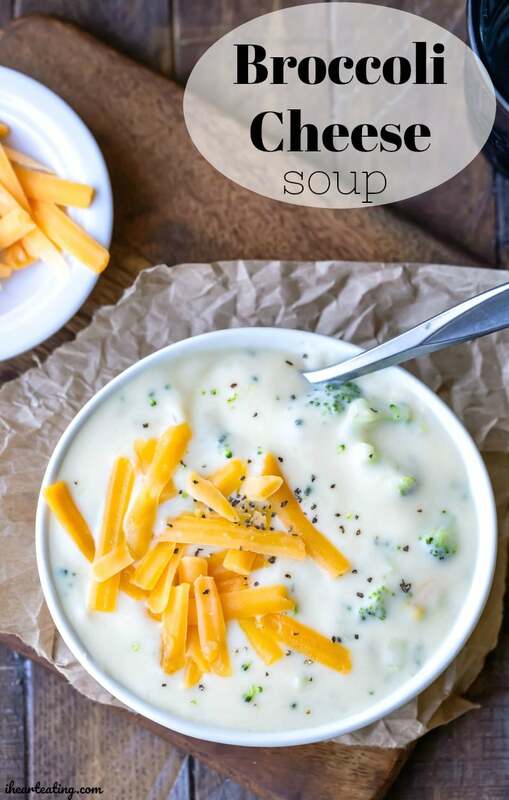 You can use any cheddar from mild through extra-sharp in this soup. You can sub a good white cheddar if you prefer. You can also use all cheddar and leave the parmesan out if you’d like. What’s good with broccoli cheese soup? 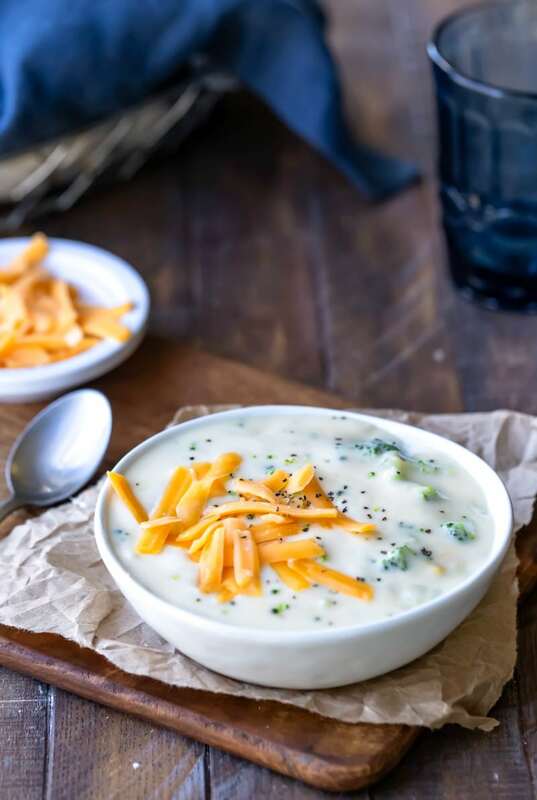 Broccoli cheese soup is good served with a piece of crusty bread for dipping, with lunchmeat sandwiches (ham is my favorite with this soup), or served in a bread bowl. More restaurant copycat soup recipes! 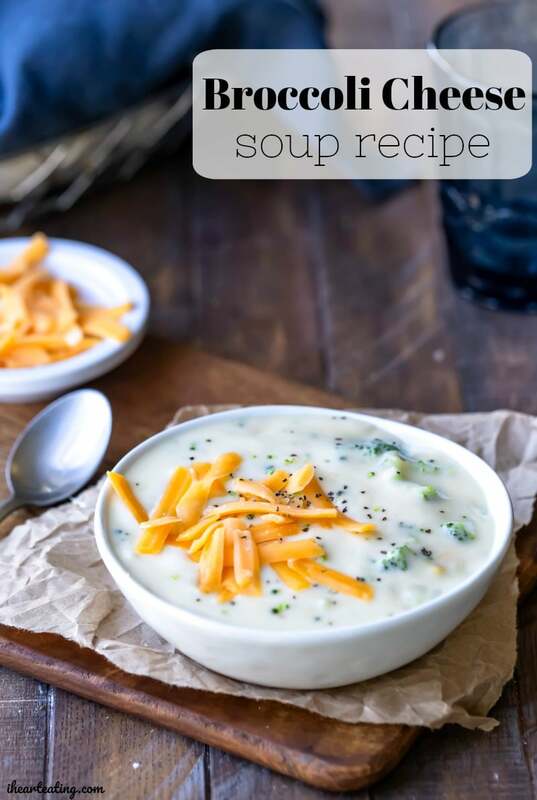 If you’ve tried this broccoli cheese soup recipe, don’t forget to rate the recipe and leave me a comment below. I love to hear from people who’ve made my recipes! You can SUBSCRIBE to receive my latest recipe newsletters or FOLLOW ME on FACEBOOK, INSTAGRAM and PINTEREST for even more delicious food. 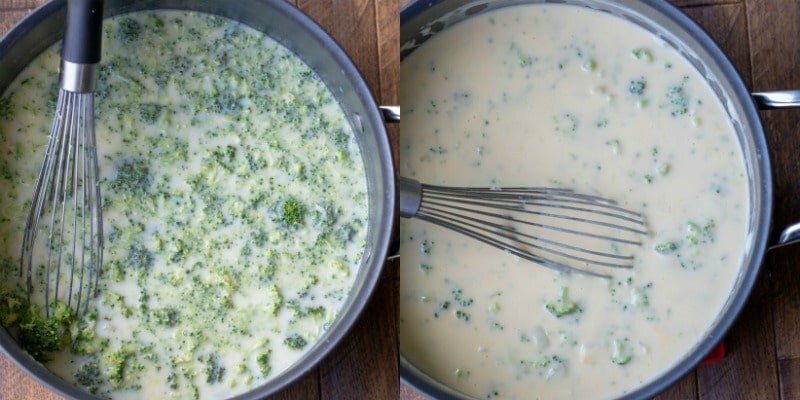 Easy homemade broccoli cheese soup recipe. Check out the step-by-step pictures and tips above the recipe for more information. Melt butter in a Dutch oven (or similar sized pot) over medium heat. 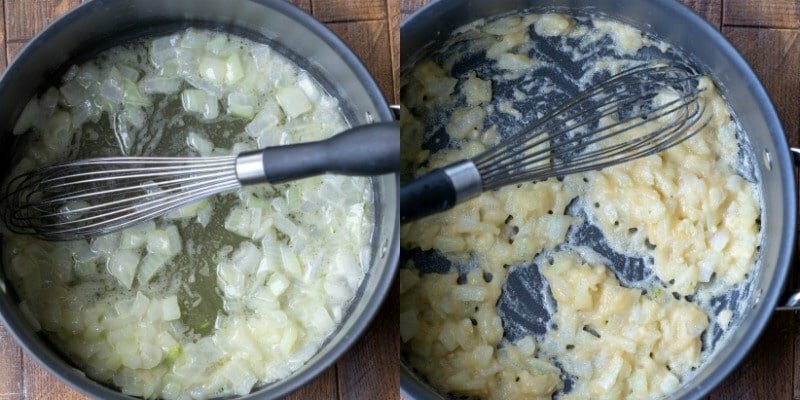 Stir in onions, and cook until onions are translucent. Add garlic and dry mustard. Cook, stirring the entire time, until fragrant, about 30 seconds. Stir in flour, and cook for 1 minute, stirring regularly. Stream in chicken broth while whisking to combine. Add milk and broccoli, and stir to combine. Bring just to beginning to boil, and then reduce heat to medium-low. Let soup cook until soup has thickened and broccoli is tender, about 10 minutes, stirring frequently. Remove from heat, and stir in cream, cheddar cheese, and parmesan cheese. *I like to use 2% milk for this recipe. Whole milk will give you a richer, thicker soup. Skim will give you a thinner, less rich soup. **I chop up the florets so that they're pretty small to avoid large chunks of broccoli in the soup. This was absolutely fantastic! My family loved it! The recipe was easy, and the soup was just delicious. Thank you for the recipe!